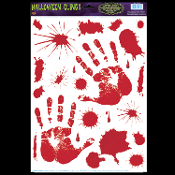 Dexter’s laboratory blood spatter pattern analysis, Psycho bathroom, zombie apocalypse, Halloween decorations, horror props! NEW Detailed SCARY, SPOOKY and GROSS... Fresh Decor from a Creepy Haunted House! *PLEASE NOTE: This is a regular window cling. Easily peel n place on any clean surface. Perfect decoration or prop for windows, mirrors, refrigerator, dishwasher, kitchen, bathroom, any room in your spooky haunted house! Easy to use - Removable - Peel n Place - Will adhere to most smooth surfaces. Place this decal on your windows, mirrors, refrigerators, toilets, etc. as a creepy surprise for family and guests!